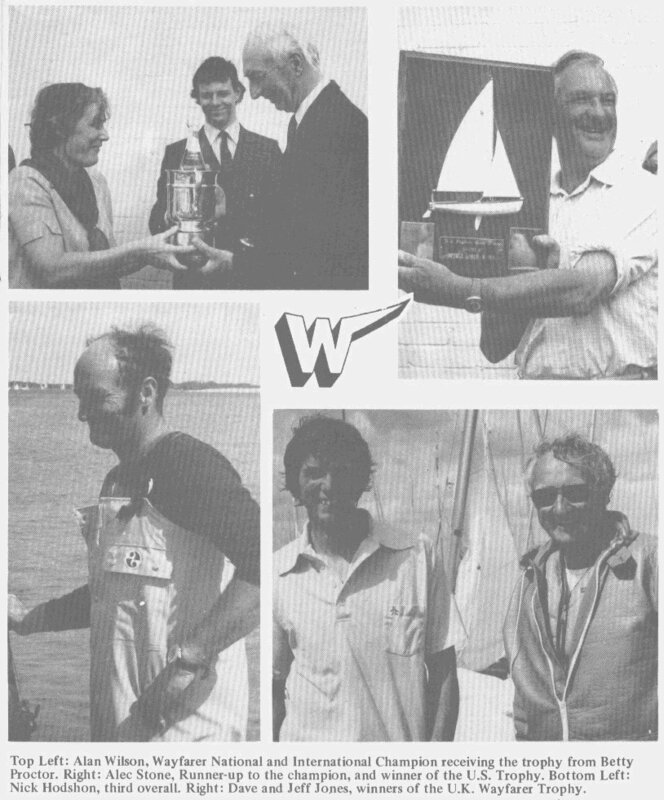 After years of preparations which included the formation of the Wayfarer International Committee (WIC) to get the four Wayfarer NCAs and their rules onto the same wavelength, the first Wayfarer Worlds finally became a reality at Hayling Island SC near Portsmouth in the south of England. IYRU nit-picking insisted we call it an Internationals, but we know what it was. A never-to-be repeated experiment saw the first three Worlds races also count as the last 3 of the UK Nationals which had attracted a huge fleet of 91 entries. The Worlds of course were limited to those who had qualified to represent their NCA – 6 each from Scandinavia, the U.S. and Canada while the UK as the host country and provider of borrowed boats to overseas crews got 12 entries (see photos below)..
Jeff and Dave Jones, Bob Reedy, Joe DeBrincat, Brian Heffernan. 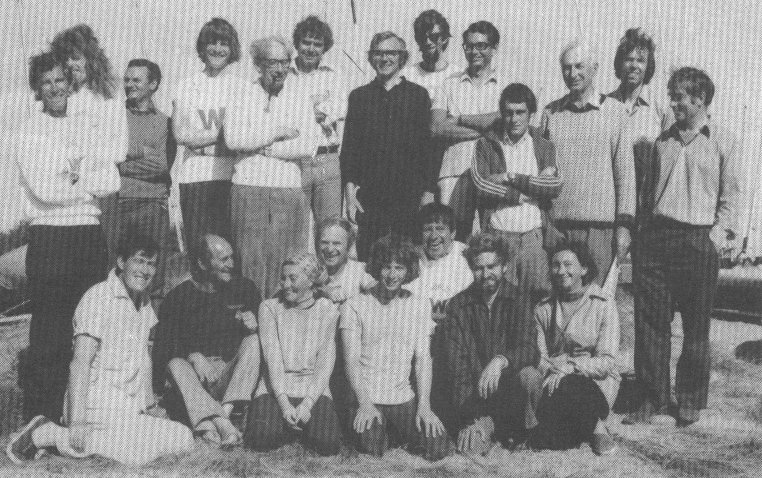 So, while your Uncle Al was sailing the US Fireball Nationals in the Rocky Mountains, the first race of the first Wayfarer Worlds was sailed on Tuesday 6 August 1974. 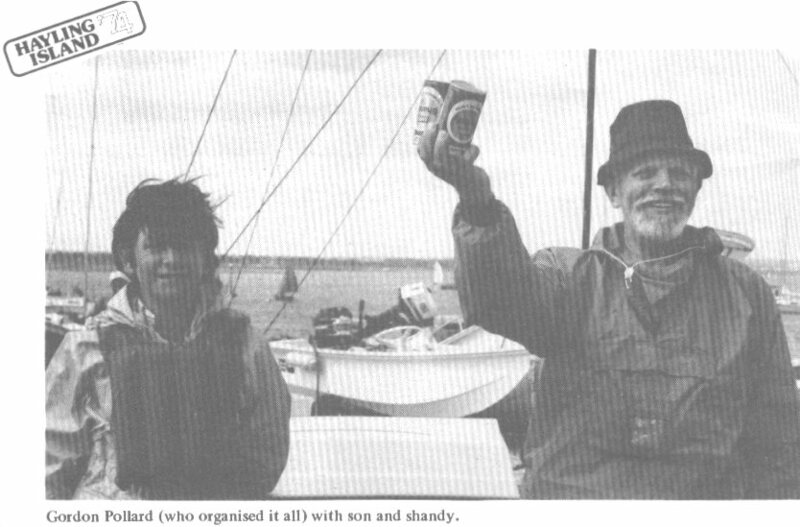 In light winds (F1-2) on the Solent south of Hayling Island, those American speedsters, Jeff Jones of Detroit and his father, Dave, took the gun ahead of UK favourites, Alan Wilson and Nick Hodshon, son of early Wayfarer star, Bill Hodshon. With a forecast for nasty weather, race 2 was moved from the Solent into Chichester Harbour, finally getting underway a couple of hours late in F4 winds that died down as the race wore on. British Wayfarers began to assert themselves in earnest: Alan Wilson, Alec Stone and Nick Hodshon placed 1-2-3 while Jeff Jones fell to 5th in this marathon 4-hour race. Back to the Solent for Thursday’s race 3. A fairly wild one as winds started out F4 but quickly grew to F5-6 with gusts to 7. Only about half the fleet finished this pivotal race of what would be a 5-race series. While a rudderless Nick was capsizing on a wild spinnaker plane, Alan was taking a firm grip on the series with another first – this one over Jeff and Alec. More of the same for Friday’s race 4: Devon boat builder, Alec Stone, was in fine form as he bested Alan. When Jeff capsized on the second beat, and Nick could do no better than 3rd in that race, the battle for the World Wayfarer title was in effect reduced to the two A’s: Alan and Alec – especially when Saturday’s race was cancelled due to excessive winds. Going into Sunday’s final race, the best Alec could hope for was a tie with Alan. He needed to win the race while Alan placed no better than 3rd. In a sunny F3-4 and the typical Hayling Bay chop, Alec did his part by winning. But it was not enough as Alan placed 2nd and captured the title (see photos below). WHAT IF?!! Who knows what the speedy Nick Hodshon might have done in that finale if it hadn’t been for the following start line foul-up described by George Blanchard in the Canadian Newsletter: A competitor barged in at the RC boat and capsized "in front of W198, Nick Hodshon, who was forced to sail over the offender. Nick’s boat ripped through the mainsail and, with the centreboard up, sailed over the unlucky Wayfarer and cleared the line with a delayed start. A fine bit of seamanship but sad for the barger."